Poster print. If you scratch this poster and sniff it, does it smell like like the acrid energy of excited oxygen and ozone? Will it make the hair on your neck stand at attention? There is one way to find out. Poster print. Does this poster glow in the dark? No. But if you hang the poster, stare at it for one minute, then immediately look at a blank white wall, you will receive complete consciousness. This data comes from the National UFO Reporting Center, which is "dedicated to the collection and dissemination of objective UFO data." That, and some census data, and we are off to the races. Of course, as is the case for any observation data, there is a strong tendency towards echoing a population map. This is certainly the case with this sighting data, as well. 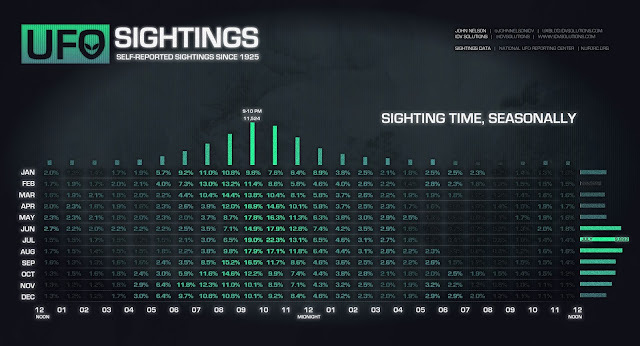 In order to visualize the actual sighting phenomenon, I needed to normalize by the underlying population. The first, more prominent map shows a simple ratio of the sightings by population. A per-capita approach. 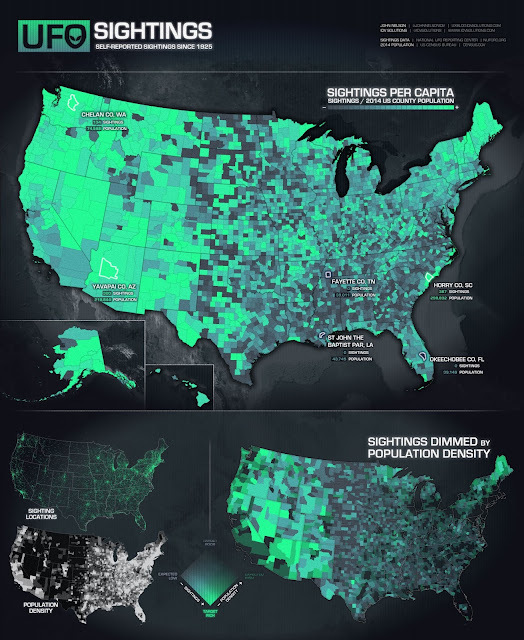 The second, smaller and slightly more complex map, shows a bi-variate mapping of sightings in the color dimension (dark slate for low-sightings and bright green for high-sightings) and population density in the opacity dimension (denser populations are more transparent). The result is a map that is more nuanced regarding the problem of variable populations and area sizes. Double normalized? Sort of. 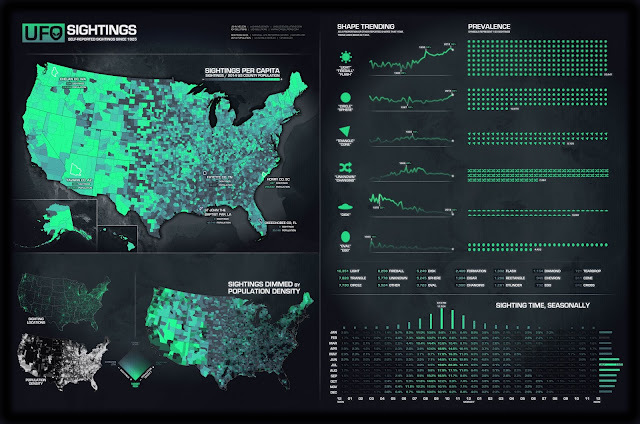 If you would like to traverse the rich and complex world of bi-variate mapping, check out this tour-de-force how-to by Joshua Stevens. Poster print. Terrain of sightings, normalized by population (because without that, it would just be a population map). Blow your visitors' minds when they see this beauty hanging proudly on your, otherwise incomplete, wall. Regale them with a nuanced conversation about the subtle interplay of underlying populations and observed phenomena. Then point to your county and say, "Right there. That one's me. Let's have a few drinks; I'm not ready to talk about it quite yet." You may be thinking, "wait a second, I thought you said aggregating non-political data into political zones was lazy and pedestrian!" That's true. I am admittedly violating my own unrequested map tips 1, 5, and 6. But I am doing it with gusto. One of those great questions that you have to ask yourself when making a visualization is, "compared to what?" That's why the shape trending section was so interesting. Shape popularity compared to other shapes. Compared to other times. Physically analogous shapes like Disk and Egg? So mid-century materialist chic. Uncertainty? So late-century neo-relativism. Flaming lights? Such millennial clarity. No matter the phenomenon, crowd sourced data tends toward a first-order trend of how we see ourselves. Poster print. Check out the USA's history of unidentified flying...fireballs? Triangles? Eggs? 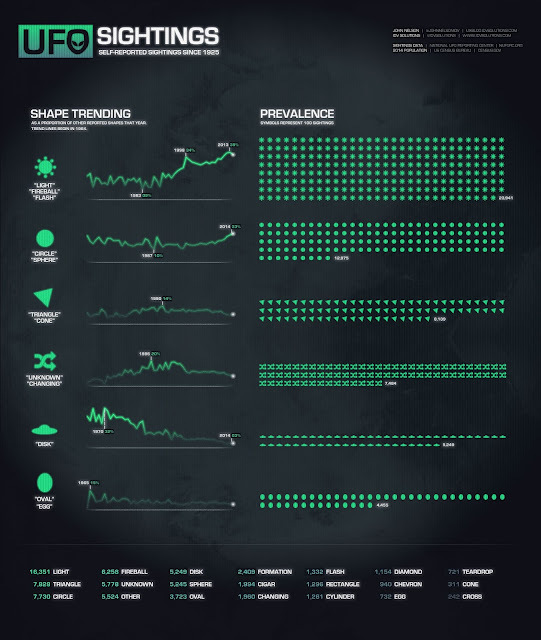 Feast your eyes on the distillations of thousands and thousands of reported sightings by what shape they were reported to be. Upon receipt of this poster, invite six friends over for a small dinner party. Reveal the chart and kick off the conversation with something like, "The postmodern age of uncertainty is eroding beneath our feed, my friends. Behold its pre-digital-age rise and abrupt fall at the hands of frenetically optimistic millennial certainty. Pedestrian notions of eggs and saucers? Robert Wise wants his breakfast back, thank you. Mbwa ha ha. Now then, who takes their absinthe with a cube of sugar?" So on and so forth. It isn't surprising that there is a clear spike in sightings on summer nights, but I wanted to see for myself. As soon as somebody sends me some time-stamped data that quantifies when people are looking up, I'd be thrilled to normalize this by it. In the meantime, I still like seeing a picture of the terrain of observation. Like the shape trending, it may be more of a revelation about our own movements, than the schedule of unidentified flying objects, but there is value in revealing that structure. If you enjoy spurious correlations, feel free to indulge here as a first step. Nice! very thourough. The trending chart was a good idea. lol, only USAnians spot so many flying saucers - coincidence? Great work! I'd love to know what happened to the sighting data in the days after 9-11, when most air traffic was grounded. With an unprecedented chance to remove aircraft as a possible source of mis-identification, as well as an edgy population scanning the skies, did sighting numbers spike, drop or remain constant? this is a great post.the nice color choice and last histogram has beautiful design. congrats! Taking a look at the time of observation by day, it seems that most sightings occur when it’s dark and when people are still likely to be awake. The season trend verifies this, with more sightings occurring earlier in the evening during winter time, and a spike during summer nights.